Cultural identity is something that we all have either encountered or will encounter later on. It is a confusing mess of terms, cultures and ethnicities. Even through those basic identifiers, there is something more complex to a person besides the environments that they have been raised in that influence them greatly. We had two members of the Summit community share with us their opinions of culture and how their identity shapes them. Rasmia Shuman (Mia to her friends), is a bright, fun-loving and outgoing person. She is a junior at Summit Preparatory Charter High School in Redwood City. Shuman explained that her devout faith in Islam is a large part of her identity. Shuman is a young woman who is not afraid of showing and teaching others about her belief in the Qur’an and about how she follows its teachings. In an interview with her, she told us about how her culture of being a Muslim American has affected her. She also shared how being a Muslim American has been for her and how she is able to balance the various aspects of her life. She also said, “Basically, I have been raised that not everyone knows what’s going on. Keep a smile on your face and not take anything offensive.” This is in reference to whenever people tend to ask her a rude question concerning her identity as a Muslim, especially those around the hijab and women’s roles in society. For Shuman, the hijab is not something that inhibits her. Rather, she sees it as a way to be modest. Shuman also shared about the conflict that can often time come with being a Muslim American. One of the struggles that she had was with her daily prayers. Specifically, she was talking about the Salah (the five daily prayers that Muslims perform every day according to the Quran) and juggling that with attending school. “I do keep up with my prayers, but there’s school and other things. But I don’t want to clash with being American and Muslim.” Shuman instead prays at home, scheduling her time to fit in her school work with her religious duties. But overall, she is immensely grateful for living in the United States. “Being in America is probably the best place to be,” Shuman noted. She cited the incidents in Germany and France, with the recent ruling of Angela Merkel to ban burqas and France’s ban on the burkini. Lissa Thiele, an Expeditions teacher who specializes in Holocaust and Sociology of Law, also focuses on how to teach others tolerance toward other people’s identities. Ms. Thiele achieves this goal by having lessons that are both exciting and informative. 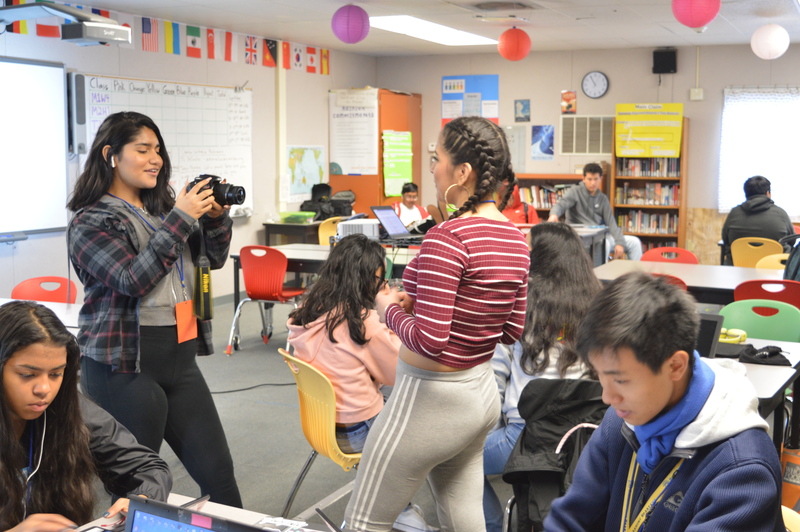 She highlights for her students that schools don’t always take an in-depth look into different cultures, even though that is an important part of what shapes our country. Ms. Thiele also told us about the differences that she tends to encounter within the understanding of the practice of Judaism as a religion versus the beliefs that are a part of the Jewish culture. She added that, for outsiders, this difference is hard to see, especially in the United States. At the culmination of everything, she wants the world to know that she is also human and that, while she might not practice the same things that others do, she can still feel pain. 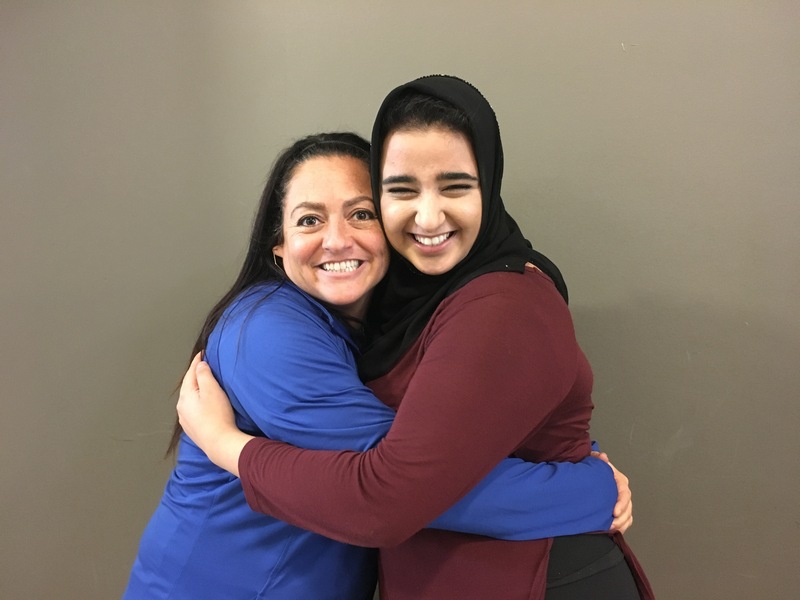 Expeditions teacher Lissa Thiele and Summit Prep junior Rasmia Shuman share a moment.